Since there were only two nominees for the two seats up for election, there was no official election. They were appointed uncontested. 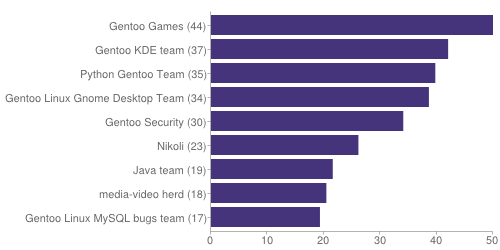 Gentoo is made up of 242 active developers, of which 43 are currently away. 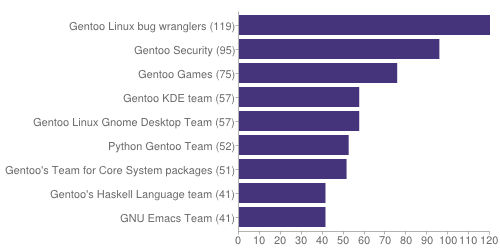 Gentoo has recruited a total of 803 developers since its inception. This section summarizes the current state of the portage tree. The Gentoo community uses Bugzilla to record and track bugs, notifications, suggestions and other interactions with the development team. The following tables and charts summarize the activity on Bugzilla between 01 July 2014 and 31 July 2014. Not fixed means bugs that were resolved as NEEDINFO, WONTFIX, CANTFIX, INVALID or UPSTREAM. The developers and teams who have been assigned the most bugs during this period are as follows. Interested in helping out? The GMN relies on volunteers and members of the community for content every month. If you are interested in writing for the GMN or thinking of another way to contribute, please send an e-mail to gmn@gentoo.org. Please head over to this forum post. 1. Hi Chris, tell us about yourself. I’m a Computer Science student studying at George Mason University in Fairfax, Virginia, USA, and I’m currently finishing my junior year. In my free time I read science fiction and play video games. I’m also a member of the student-run computing club and Linux user group on campus. 2. Bring us back to your start with electronics and computers. Not all that much to say here; I’ve been playing with (and breaking) computers since I was about three years old. As my parents can attest, I managed to mess up my first computer within a few days of getting access to it, to the point of needing a complete reinstall. 3. How did you get involved with open source, and what path did you take to become a Gentoo developer? I became involved in open source in high school; the school had a student-run Linux computer lab, and I joined the team in my second year. We used Gentoo heavily in the lab, and I ended up getting a lot of experience maintaining it there (and installing it—I made a point of grabbing any old odd-architecture hardware that came through the lab and putting Gentoo on it). I filed a few bugs and wrote a few in-lab ebuilds during my time there, but nothing too major. Once I left and went to college, I decided I wanted to start actually contributing to Gentoo. The recruiters suggested a few different ways to contribute, and I ended up working with the KDE team, which put me on the road to becoming a dev. 4. Hows your programming skills and are they important in becoming a developer? My programming skills aren’t anything special, enough to get through my classes and all that. I would say that the average developer needs to know enough programming to decipher error messages, do basic bash scripting, and understand how to read most code (to find and fix basic errors in packages). Entry-level knowledge, you don’t have to be a coding wizard. 5. Tell us about your mentor and the process to become a developer? My mentor was tampakrap, the KDE team lead at the time, who has since ventured forth into the forbidden realms of the Infra team. After I had been contributing to the KDE team on bugzilla for a couple months, he asked if I was being recruited yet, and then if I wanted to become a dev. After that, I spent some time contributing to the KDE team repo, and was assigned tommy as my recruiter. 6. How can Gentoo improve? One aspect of Gentoo that I think is both one of our biggest strengths and weaknesses is the very independent-minded culture among our developers. While this is not in itself a bad thing, it leads to a lot of instances where people refuse to cooperate or communicate, get very territorial about their packages, flamewars on gentoo-dev@, and so on. I think the project as a whole would be improved if developers were a little more civil and cooperative and a little less quick to shout at each other. 7. Tell us about some of the projects you are involved in. I started out as a KDE team member, and am still a member (though recently I’m a lot less active there than I should be). Also, I am currently the sole developer in the theology team, though that isn’t so bad since it’s a small set of packages and the release schedules are pretty slow. I’m also one of the more recent inductees to the Security project (along with Pinkbyte and zlogene), a GLEP editor, and of course, I am a member of the QA team. 8. The QA project just made a overhaul, what does the project do, who is involved, where would you like to see it in 3 years? The purpose of the Quality Assurance project is to help maintain consistency throughout the Portage tree and prevent things breaking. The project is also tasked with keeping documentation up to date. The current membership is available on the wiki, but every developer should be doing their part to minimize tree breakage (and this can be as simple as always running repoman when committing!). Right now we are having a lot of growing pains, since we were handed a vague mandate of “maintain quality in the tree” (not particularly well defined in GLEP 48), had basically no notes or direction from the remains of the previous team, and as I’m sure you’ve noticed, have had our share of missteps as we figured everything out. I am listening to the complaints, though, and we will improve. In three years, I hope to see QA as a respected and reasonably non-controversial group of developers serving as the technical counterpart to the ComRel team. It’s a long way between where we are right now and that ideal role, though. 9. I see you as very organized and able to stay calm in flame wars, how do you do it? Contrary to appearances, I am not all that calm when I’m in the middle of a flamewar, I just don’t show it. I do my venting outside of Gentoo channels, as several of my friends can attest, since I make a point of trying to be professional and calm when dealing with Gentoo matters. I also have gotten better at knowing when an argument is going nowhere and it’s most productive to just step away from the computer. 10. What are you learning from being a team lead? Two things. First, that there are some decisions where no matter what you choose, somebody will be upset. Second, that people’s perception of you and your team is everything when you want people to cooperate. 11. What are your favorite programs? Firefox for web browsing, Thunderbird for mail, Pidgin for IM/IRC. 12. Age old question for Gentoo, how can we get more help? Proxy-maint is probably the first place I’d want to expand in order to get more help. My impression is that there are a lot of users out there who want their specific package in Portage and are willing to help out to that end, and so we should be welcoming them and helping them to maintain their ebuild (and hopefully, stepping up further and becoming devs). 13. Describe your desktop setup (WM/DE)? KDE, of course, though for a long time now I’ve only really been using the WM and the terminal app, since most of the work I do is done on the command line. 14. Tell us about you boxes and home network setup? Since I’m at college, there isn’t much of interest here. My main computer is a three-year-old laptop which dual-boots Windows (for games) and Linux. I also have a Pandaboard ES which I occasionally fiddle around with. 15. 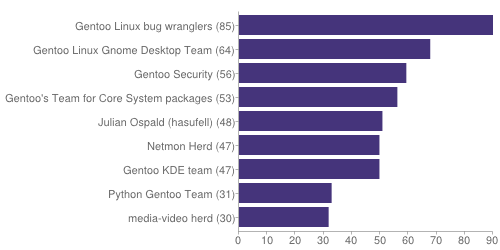 What gives you the most enjoyment within the Gentoo community? Closing bugs. It’s always satisfying to be able to say that you’ve figured out an issue and fixed it. 16. What gives you the most enjoyment outside the Gentoo community? Video games. I like games that involve building things, games that involve space, and strategy/tactics games. 17. What are your plans for the future, where do you see yourself 5 years from now? I hope that in 5 years, I will still be doing Gentoo work. I also hope to be employed. That would be nice. GSoC 2014 is going to start soon! We are right now in the middle of the community bonding period. Students and mentors are getting to know each others before projects start for real on May 20th. This is also the perfect time for them to review documentation and polish their plan for the entire project duration. You are welcome to follow developments in the mailing list at gentoo-soc at gentoo.org or on Freenode in the #gentoo-soc channel. There you can interact with students, mentors, and offer suggestions. Short description: I am interested in improving and expanding the capabilities of Gentoo Keys. Gentoo Keys is a Python based project that aims to manage the GPG keys used for validation on users and Gentoo’s infra servers. Gentoo Keys will be able to verify GPG keys used for Gentoo’s release media, such as installation CD’s, Live DVD’s, packages and other GPG signed documents. It will also be used by Gentoo infrastructure to achieve GPG signed git commits in the forthcoming git migration of the main CVS tree. Short description: This project is aimed at adding python3 support to Layman while maintaining backwards compatibility with python2.7, as well as adding new features to the codebase. Short description: The Micro Gentoo project goal is to create an extremely minimal Gentoo VM and fetch compiled files on-demand. These files are initially on a remote server. Meanwhile, the project also considers the smooth-secure OS updates and remote repositories selection. I would comprehensively base my work on the technologies of uCernVM, Chromeos and CoreOS, and then adapt them to Gentoo. The deliverables include Micro-Gentoo building scripts, updaters, eselect module and patches to genkernel, etc. First of all, “GLEP 63: Gentoo GPG key policies” is finally finalized. Yay! You can find the approved text version here . Most important part, if you want to follow the best practices you need a RSA (v4) 4096bit main key with expiry time of at most 3 years. Hard requirement for the main key is either DSA 2048bit or RSA (v4) >=2048bit and maximum 5 years expiry time. Anyway, this means we can actually start thinking about some marginally more advanced topics such as, say, even maybe sometime in the future signature verification! Then… regarding the Filesystem Hierarchy Standard. Some debate had come up whether packages (i.e. udev, eudev, systemd) storing default config files in /usr/lib violate existing policies. End result of debate and motion was that this is OK and that no additional policy is required. Next, we discussed some recent commits around virtual/libudev and the sequence of events that followed them. The feeling was that no additional policy is required at the moment, but that it would be useful to state the opinion of the council regarding these events. So, we wrote it up and sent an e-mail , please read it and keep it close to your heart. Gentoo is made up of 232 active developers, of which 32 are currently away. 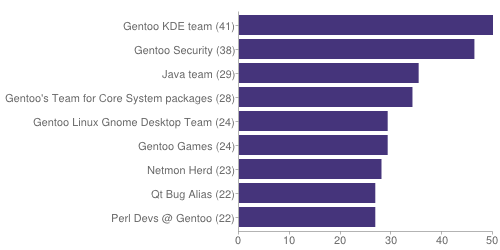 Gentoo has recruited a total of 794 developers since its inception. No new developers have joined the project this month. The Ruby and Java projects are looking for help to keep jruby dev-java/jruby up to date and included in the portage tree. See this blog post and bug 442230 for more information. Moreover, proxy-maintainers are looking for new developers as well. The following tables and charts summarize the activity on Bugzilla between 29 March 2014 and 28 April 2014. Not fixed means bugs that were resolved as NEEDINFO, WONTFIX, CANTFIX, INVALID or UPSTREAM. The following table outlines the teams and developers with the most bugs resolved during this period. What is Portage File List? Portage File List collects which files are installed by which ebuild on users machines. It shares this data publicly for searching/browsing. PFL needs Portage data from your system. The more ebuilds you have installed the better. The more exotic ebuilds you have installed the better. Every Gentoo user can help! This will install a cron job that submits new data to the PFL servers every week. Don’t worry, your privacy remains protected as we are not collecting anything else than portage data, and we don’t store who sends what. As a bonus you get /usr/bin/e-file a command line utility to search for files installed by ebuilds. It allows a user to search for files that are not installed on their system and figure out which ebuild they need to install in order to obtain it. E-file requires internet access to obtain its information from the PFL website and database. Pfl is quicker than equery to search for files (even if not installed locally), while equery is more powerful and gives more options to search. Equery is limited to currently installed packages only. The equery program is installed with the app-portage/gentoolkit package, a collection of administration scripts for Gentoo. 1. To get started, can you give us a little background information about yourself? At university, I study the Computer Science programme with a specialization in Software Engineering. As the last year starts now, my student time is almost over. Over the last years, a lot of programming languages have passed by there and on Gentoo Linux; which makes participation in both of them really worth it. Besides programming, listening and playing some music is what I like to do. Currently I own an electric guitar, which sometimes is played on; but maybe I go for another instrument soon and practice in a more dedicated manner. Occasionally, I play FPS or RTS games too. 2. Tell us about your introduction to Gentoo? The first look at Gentoo was when I was a dedicated enthusiast Windows user, who would run as much on Windows as possible. Once I’ve tried to set up a Windows / Linux combination by running SUA / Interix together with Xming, but as I barely knew Linux back then that didn’t come to a good end. Later, Linux was needed for university; as we needed to guarantee our software compiles and works on the lab computers that run Linux. Having used another distribution in a virtual machine for some time; I discovered that it was slow without hardware virtualization, which we didn’t have yet back then. Something fast and small on a separate partition was needed; and thus, a small bit of space was cleaned out at the end of the partition and Gentoo was used to create a quite minimal setup with just what’s necessary to develop, compile and test. When the need for that was over, the small partition was ditched; thus I have been using Windows for several years, but with Windows 8 going RTM and the changes that happened I started to realize that I wanted an OS that can be changed to what I like, instead of doing things the way in the limited amount of ways they can be done. So, Gentoo Linux came back in mind; and that’s how I made the switch to it last year. 3. Describe your journey to become a Gentoo developer? Not long after becoming an user of Gentoo, I decided to contribute back; so, I started to try to package some things that I used on Windows or which fitted the current needs back then. From there on I looked for ways to contribute, at which time I found a blog post that the kernel team is looking for users to help; there was too many users, so, I didn’t make the cut. Apparently, none of them sticked to it; so, later I got back to try again and then the kernel lead mentored me. As this was a good opportunity, the next days were spent on studying the development manual and answering the quizzes as detailed as possible; I took a self-study approach here, looking back on it having seen every part of the devmanual certainly gains you a lot, as you can recall where things are and know enough to not break the Portage tree. After a recruiter reviewed the quiz responses a year ago; I learned more during the review, that’s how I became Gentoo Developer and six months after I switched from Windows. 4. What are some of the projects you are involved with and the packages you help maintain? Besides working on our Kernel releases, recently I have joined the QA and Portage team to keep the quality of our distribution high and improve repoman; in the longer end I plan to improve Portage and/or pkgcore when I get to learn their code base better. 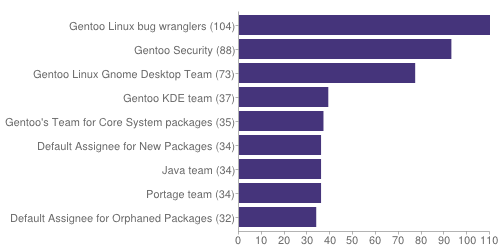 Other teams I am on are the Proxy Maintainers (to help Gentoo users maintain packages without them needing to become a Gentoo Developer); as well as the Java, Dotnet, Bug Wranglers and Bug Cleaners projects. The last two projects help get bugs assigned and cleaned up. Next to those projects I maintain or help maintain some packages that I either personally use, am interested in or where work was needed. One of the last introduced packages is Epoch, a new minimal init system. It boots extremely fast on the Raspberry Pi. 5. I proxy-maintain a few packages myself. I am a staff member without commit rights. Its a great way to give back and also help maintain a package that you like and use. To prepare I did the ebuild quiz for my own understanding of ebuild writing and set up a local overlay to test my ebuilds. What are some other ways a user can become confident enough to maintain some packages? The basic guide to write Gentoo Ebuilds is a guide that was started to cover the very first steps to writing an ebuild; this resource was previously non existing, it was written to close the gap between having no prior knowledge and the Gentoo Development Guide. The Gentoo Development Guide is a great reference to find most details and policy one needs to know for writing ebuilds; when working in the terminal, checking out man 5 ebuild can be handy to quickly look up syntax, variables and functions of the ebuild format. Creating a local overlay allows you to start locally experimenting with ebuilds. When you feel confident you can request a hosted overlay (or create one yourself on a third party service like GitHub and file a similar bug requesting it to be added to the overlay list) or contribute to the Portage tree (through proxy maintenance or you can become developer if you want to) or an existing overlay. When you do proxy maintenance, the proxy maintainers will help you by advising and reviewing the ebuild and letting you know how to improve it; if you work on an overlay, there are other mediums (where proxy maintainers are present as well) to ask questions or get your ebuild reviewed. For example, #gentoo-dev-help on the Freenode IRC network is helpful. to check for QA errors, QA keywords are explained in the last part of man repoman it can help find common mistakes, as well as help increase the quality for it to be added to the Portage tree. 6. What do you think Gentoo’s strengths and weaknesses are both as a development platform and as a general purpose Linux Distribution? and write a patch for one or more file(s), then put the patch in /etc/portage/patches/app-bar/foo and there you have your patched code. Besides patching up packages, the USE flag control in Gentoo is what makes Gentoo powerful. This controls the features of packages to allow you to have packages fit your usage rather than become bloated with features, libraries and other size hogs you never need. Alongside USE flag control becomes the ability to choose alternative libraries, alternative GUIs more; which is nice when you prefer the way something works or looks like. What I think Gentoo could use more is more manpower; what made Gentoo powerful is its community, and its community is formed by users who contribute. 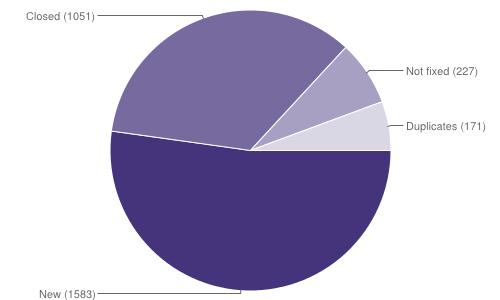 And to this extent the amount of contributions determine how powerful Gentoo becomes. If users are interested; they are welcome to contribute to Gentoo, to make it even more powerful than ever before. They don’t necessarily need much prior knowledge, there’s something for everybody; and if needed, we can help them learn more. 7. Can you describe your personal desktop setup (WM/DE)? As desktop environment; I use GNOME 3, I’m glad to see the way they have progressed in terms of their user interface. GNOME 2 I’ve also used in the past, because I didn’t bother searching further too much; but didn’t really like GNOME 2’s UI. GNOME 3’s UI gets out of the way and I like how it focuses on the more typical user that has no special requirements. Alongside that comes the requirement to run systemd; though that was in use long before running GNOME 3, as a while ago I was on XFCE and was experimenting around to see if systemd fits certain needs. It does; so does XFCE as well, so while I don’t really like it UI like with GNOME 2, I considered XFCE as an alternative DE to switch to. However, very recently I’m using MATE on top of GNOME 3; if GNOME 3 breaks, MATE is my new alternative DE. On the Raspberry Pi, Epoch gets the boot time down to seconds; as it was bothering that it previously took over a minute, as that is what running init scripts (which are shell) does together with all what they call when you run it on slow embedded hardware. Whereas Epoch is a daemon with a single configuration file that just starts a few processes and that’s it. It also helped for bisecting as well as hacking up a reclocking patch for the Nouveau module a bit; while making it work on the NVIDIA card, the patch is still unstable and might break other cards and further improving it is quite a steep learning curve and a lot of work. 8. What are the specs of your current boxes? Currently I own a Clevo W870CU barebone laptop that is put together; it features a Intel Corporation 5 Series/3400 Series Chipset, a Full HD 17 inch screen and enough interface ports. The processor in it is an Intel(R) Core(TM) i7 CPU Q 720. As hard disks I use a Intel X25-M 160 GB SSD and a Seagate Momentus 7200.3 320 GB HDD. There are also a NVIDIA GeForce GTX 285M, Intel Corporation WiFi Link 5100 and Realtek RTL8111/8168/8411 PCIE Gigabit Ethernet Controller inside. As for the Raspberry Pi, it is a model B; you can find its specifications here. I gave it a 32 GB SD card with Gentoo on it where the 32 GB gives it some room before wearing it out. Alongside there are two external drives of a few terabytes to store big data and backups. The Raspberry Pi here kind of acts like a cheap all-in-one NAS and/or media solution. 9. As a Gentoo Developer what are some of your accomplishments? On the kernel team, the kernel eclass and genpatches scripts were adapted to bring support for experimental patches; this allows adding experimental patches to kernel packages using USE=experimental, without applying them by default. A condition for an experimental patch to be added is that applying the patch does not change the runtime behavior; in other words, we want changes to be guarded by a config option, in addition to USE=experimental. The eventual end goal is to have a lot of the regular experimental patches supported, to deduplicate work amongst kernel packages and our users. Besides making improvements to the kernel packaging I maintain packages that I use and/or packages that need maintenance; at the moment, MATE is being brought to the Portage tree. Quality Assurance work I also do to keep the quality of the Portage tree high. While not having anything specific in mind, developing on “something” is what I have in mind. In the context of the business world, that could be solutions that aid users with their daily tasks; in the context of the gaming world, maybe some indie game in the hope that it grows out; and last, I listen to music a lot, so, maybe within that context it could be some kind of computer science solution within that field. Relying on yet-to-discover science is what I’d like to avoid, and rather rely on what is a given already; such that becoming popular is the only real risk. Once popularity has been obtained, then exploration might become an option; although one should not ignore that exploration can lead to popularity, but as said that is not without risk. 11. What users would you like to recruit to become Gentoo Developers? Good question; many people are qualified, anyone that’s interested can expect help from us. 12. What gives you the most enjoyment within the Gentoo community? Giving back to the community as an appreciation of what the community has given to me. That page contains a list of developers for whom we need more information — we want to visualize everybody’s contributions. If you are or know a developer on that list, please get in touch with us via bugzilla. e-mail, twitter, google plus or IRC in #gentoo or #gentoo-dev. In the fiscal year 2013, for the period of July 1st through June 30th we had total assets of $73,494.40. Our main income was $7,000.00 from GSOC, next was donations thru paypal for $6,386.94 and the official Gentoo store generated $558.85 in commissions. Our expenses totaled $3,396.01 with $2,399.23 to Gentoo GSoC 2012 mentor’s summit travel reimbursement. Our expenses are kept to a minimium because of all our generous sponsors plus the work of our Infrastructure team to secure donations of hosting, hardware and bandwidth. Requests for funds, project support, or equipment need to be sent to the Foundation in the form of a proposal. This proposal is to inform all trustees of the need (not all of them will be aware of the need or the background of the situation). The proposal process will also help to maintain a trusting relationship between the Foundation and its donors. Donors know and expect that without exception money will only be spent after a proposal and vote by the Board of Trustees. Additionally, the proposals will be archived to provide accountability for money spent. Please review our policy documentation for more information. The Gentoo Ruby team would like to inform you, that the default active ruby targets changed from “ruby19 ruby18” to “ruby19 ruby20”. If your currently eselected Ruby interpreter is ruby18, our recommendation is to change it to ruby19. At the moment Ruby MRI 1.9 delivers the best possible support of all Ruby interpreters in tree. 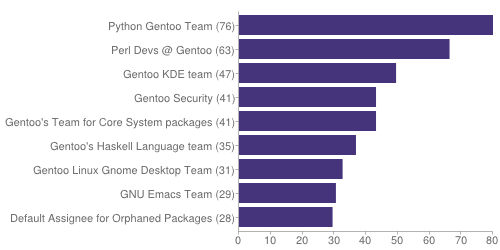 Gentoo is made up of 252 active developers, of which 38 are currently away. The following tables and charts summarize the activity on Bugzilla between 25 February 2014 and 27 March 2014. Not fixed means bugs that were resolved as NEEDINFO, WONTFIX, CANTFIX, INVALID or UPSTREAM. The developers and teams who have closed the most bugs during this period are as follows. Gentoolkit has a little known utility called enalyze. Enalyze analyzes the deployment information Gentoo keeps of all packages and checks this against the current settings status. – the “rebuild” module which allows for rebuilding package.use, package.accept_keywords, and package.unmask files which can be placed in /etc/portage. The difference between it and equery, is that equery does specific queries, while enalyze does complete reports. So, essentially it can be used as a tune up or repair kit for your gentoo system. It does not do everything for you, it does leave some of the decision making to you. But after reviewing the reports, you may want to edit your make.conf to optimize its settings. An interesting feature is that enalyze supports creation of new package.use, package.accept_keywords or package.unmask files based on the currently installed package information, your current profile and make.conf settings. Through it, enalyze can help you rebuild these files or remove obsolete entries from it. This produces a report of all use flags used by packages on your system as well as how they are used. It shows if a USE flag is enabled or disabled, and shows if the USE flag has a “default” setting (a summary of: a profile enabled USE flag, a global make.defaults USE flag, etc.) For each USE flag, the packages that use it are listed as well when called with the -v module option. From that information you can edit your make.conf’s USE= and remove any flags that are already defaulted. if there is a flag that has more than a few packages using that setting, you could add it to the USE= instead of relying on having that flag in package.use for those packages. Will generate a new package.use file (neatly sorted) of only the entries needed to preserve the current state of the packages installed. Once you check over the file, add some custom tweaks (to your satisfaction) you can replace the existing or missing file in /etc/portage. It also runs completely as any user in the portage group. There is no need to run it with superuser rights. Any files generated are saved in the users home directory. Tip: It is very useful for changing profiles too. Just run them to adapt to the new profile and the new defaults. P.S. There is room for the utility to get many more reports and rebuild options. So, submit your requests (and hopefully code). 1. Hi Sven, tell us about yourself? My name is Sven Vermeulen. Although Sven is a primarily Scandinavian name, I have no roots with Scandinavia. I’m born (and still living) in Belgium, growing up with geeky domains such as technology, math, science and computing. In 2005 I graduated as engineer and started working for KBC, one of Belgium’s leading financial institutions (bank & insurance). In it, I always kept technology close to me, first as system engineer and now as IT architect. My interest in technology & science never faded. Although computer systems and software development are my primary hobbies (as they can be handled hands-on easily without heavy investments) I still like to learn about the progress made in other fields and give myself exercises to keep my knowledge on those fields up to date. And for some reason, that always tends to help me with my real-life work (for instance for contract optimizations I used mathematical optimization methods). I live with my daughter close to my work (between Brussels and Antwerp) which allows me to go to work by bicycle if my presence isn’t needed elsewhere. My work does require me to go abroad from time to time, but mostly within the European Union. In my free time I enjoy … wait, free time? Nope, don’t have that nowadays. Let me rephrase it: if I had more free time, I’d probably spend it jogging or swimming (which I currently only do to clear my mind), sitting behind my computer (programming, documenting or just playing around), watching cats do stupid things on my tv (youtube – I don’t have cable or other TV services) and playing board games with friends. Alas, most time is spent either on work, on working in my home (renovations) or providing taxi services to my daughter. 2. How did you get involved with Linux and Open Source? That started in ‘96 or ‘97. I got a RedHat installation to play with and thought I could become a kernel developer with it. Well, I did have lots of imagination back then 😉 But I did enjoy the difference from the previous operating systems I used (Atari and Microsoft DOS/Windows) and was quite hooked by the idea of free software (I think then it was still mostly coined as “open source”). I never deployed anything commercial / proprietary on my own systems anymore since. The BBS’es (and later Internet) provided all the information I needed to continue with free software. And as a C programmer (not saying I’m good at it, just saying I program in it) I took on the challenge of supporting my (then unsupported) Matrox graphics card with dual output in Linux. I got good help by the Linux development community, and got in touch with Linux’ internal structures. Which I immediately embraced as a new source of knowledge, as I moved to software engineering in my studies. All software related things I did were in the free software world, patching here and there. After a while, I stumbled upon the next challenge, which was convincing other users to use free software. A major gap in this area was documentation, so I started learning about writing good documentation (I’m still disappointed that the Darwin Information Typing Architecture (DITA) hasn’t broken through), which is about the point that I joined Gentoo Linux. In Gentoo, I first helped with translations, then moving on to English documentation, authoring, etc. Internally, I’ve been through various roles (regular developer, project manager, top-level project lead, trustee, council) in various areas (most of them non-technical, such as documentation, PR, recruitment). After quitting and joining a few times (I seem to have ups and downs in available time) I’m now running to keep the Gentoo documentation maintained, as well as supporting SELinux through the Gentoo Hardened project. I often bounce from one technology or software to another, depending on the needs of the day. Need to detect installed libraries (in order to track potential vulnerabilities) but can’t find a tool? I’ll write one. Want to confirm secure configurations? I’ll learn about SCAP technologies and implement that. Require a web-based question & answer application? Let’s look how HTML5 works shall we. I’m pretty fluent in learning about technologies, protocols and what not. 3. I read your book Linux Sea and not only was impressed, really enjoyed it. Doing a Gentoo Linux install using the book as a classroom textbook would be the kind of class I would love to take. How did the book come about, and why Gentoo? I wanted to create a documentation resource on Linux, discussing how Linux operating systems work (the concepts and architecture, but without diving into the details and advanced usage) and to which I can refer people who have a need for understanding a particular aspect of the operating system. As a target distribution, I choose Gentoo because there aren’t many resource on Gentoo, and because Gentoo sticks close to the implementations of the projects themselves. There are no interfaces or APIs surrounding any of the functionalities that a Linux operating system provides, so I can easily discuss the real implementations. Not completely a “Linux from scratch”, but sufficiently close. Another advantage of using Gentoo as example distribution is that readers, who use different distributions, can still enjoy the book (as it explains how things work) and then refer to the distribution-specific information of their distribution to go further, now with the knowledge of how things work “under the hood”. 4. With your skillset you would be welcome in any project, why do you support Gentoo? I switch between many interest fields, and Gentoo is one of the few distributions that caters for it. If you need a responsive desktop, Gentoo can offer that. You want good support for many graphical environments? Gentoo can offer that. Need to implement a secure server: yes, Gentoo can offer that. Want to run Gentoo on a very small, lightweight device? Gentoo can offer that. Want to create a Linux router? Of course Gentoo can offer that. If I want to do something similar with another distribution, I would most likely need to use a different set of distributions depending on my needs. A second reason is the flexibility offered by Gentoo. Many tools offered by Gentoo are meant to assist in the maintenance and use of one or more tools or services, but without limiting the configuration abilities of the underlying components. Take portage for instance: you can hook into the various phases of package deployment easily, and many ebuilds support epatch_user, allowing for customizing deployments without removing functionality offered by Gentoo. Or OpenRC’s dependency-based service scripts. Instead of naming it with a number depending on when you want to launch it, just put in the necessary dependencies in the scripts and you’re all set. That’s not just easy. That’s what makes Gentoo unique and powerful. 5. What could we be doing better? I think we should be focusing more on (functional) areas than package sets (herds), and looking for ways to innovate in those areas. Right now, we’re happily following along with (most) upstream projects, and doing our job as a distribution that upstreams patches and supports users. But why not look for more innovative ideas? Be open and bold with ideas, discuss them publicly (now that we have the Gentoo wiki, this should be easy to implement), create concept code and documentation. Do things other distributions can’t. We should dare to fail, in order to learn. Right now, it seems that we’re sometimes afraid of making the wrong choice. We’re an organization with several hundred developers and volunteers, but not bound by service agreements, contractual obligations or implied functional adherence based on financial contributions. We should leverage that and move towards more innovative fields. A second item that I believe would improve Gentoo as a distribution would be to remove complexity. Often, we do things in a somewhat complex way because there is no other way. That’s fine. But after a while, new and simpler methods come by that should replace the functionality we implemented more simplified. Think about how the Gentoo Handbook is currently developed. We used our own format / syntax for reasons that were, back then, correct reasons. But things move on and mature. And while there are now much better alternatives available, we can’t use it because we customized everything to our needs. Writing documentation in the Gentoo Handbook almost requires you to learn how to program, as we use keywords, conditionals, include directives, automatic link generation, string substitutions and more. This is complex, and we should focus on simplifying this. *I* should focus on simplifying this. I’m pretty sure other examples can be found. Are all our eclasses still fully needed? How come the ruby-ng eclass is quite different from python-r1 eclass, even though they generally want to offer the same functionality? TIMTOWTDI, but if there is a method better and more simple than the other, use it. 6. Describe to our readers the relationship between the council and the foundation? Basically speaking, the council is for technical matters and organization with regards to the Gentoo project, whereas the foundation is for the legal and financial aspects to support the Gentoo project. The two work orthogonal to each other (I am not aware of any overlap). 7. Is this relationship working, does it need to be changed or improved? I think this is working pretty well and see little room for changes. 8. Same question for improving our partnership with Förderverein Gentoo e.V. The Förderverein Gentoo e.V. and Gentoo Foundation, Inc. are sort-of siblings. After the decommissioning of Gentoo Technologies, Inc. each organization took on the responsibility of protecting the Gentoo trademark and supporting the Gentoo project in their home base: Förderverein Gentoo e.V. in Germany/Europe, and Gentoo Foundation in the United States of America. 9. What about moving the Gentoo Foundation to Belgium or somewhere in Europe? I don’t think (re)locating a company to a specific location helps if there isn’t a need to. We should focus on what matters: protection and support of the Gentoo project and its intellectual property, and then evolve towards a structure that can easily support this now and in the future. 10. What documentation is moving to the wiki? Well, right now we want to have all GuideXML documentation (which is non-handbook formats) on the Gentoo wiki. Most of the GDP-maintained documents (those in /doc/en) have been moved already, and moved into the main name space of the wiki so that others can contribute to it. That is also one of the main motivations for the move, as the Gentoo Documentation Project, for now, has insufficient resources to maintain GDP-only documentation. In the next phase, handbook format documents (such as the SELinux Handbook, Gentoo Security Handbook and eventually the Gentoo Handbook itself) can be moved to the wiki as well. For the Gentoo Handbook though, this is more than just a copy of the data – it will require a refactoring of the documentation into a way that we can structure. I know the wiki supports inclusions and even conditionals, but this is some complexity I want to remove from the handbook. A second thing a3li and I will look into (when time comes) is the ability to actually generate booklets from the wiki (like wikibooks.org does). I think this is a logical consequence, as those plugins (as used by wikibooks) are made with larger documents in mind, and allow us to align the documentation development with those best practices as gently suggested by the plugins. But to do so, I believe that the architecture-specifics will need to be cleaned out. Either an entire chapter can be written independently of an architecture, or it can’t. Having a chapter that is “mostly” for one architecture, but with parameters and variables for each architecture just to make sure it reads fine for that architecture, is probably not doable or maintainable. I have considered moving the larger documents in DocBook format (which is the format I use for my other, non-Gentoo documents), and that is still not abandoned. I guess I’ll need to sleep over it some more. But first make sure that our wiki is qualitatively up to the standards we once had for our documentation. 11. With the documentation moving to the wiki have you noticed more contributions from the community? The main advantage is that there are new documents being created of good quality, which upon discovery I also mark for translations (so that our translation teams can provide the same documentation to non-English readers) and perhaps even add metadata to it (so that it is taken up in the “featured documentation” overview). The Gentoo wiki is constantly growing, and is more and more becoming a standard source of information when trying to debug or troubleshoot issues reported on our support channels or forums. 12. What should we be doing to get more users involved? One thing is to make it clear to users that the wiki is open for everybody, and that we welcome all additions. Even when the change is not within the expectations of the English language (style and grammar) as we have enough people watching over to fix these styles and who do this gladly, without any remark towards the original author. Not everyone is fluent in English, and we shouldn’t restrict contributions to language puritans as the broader community has a lot more knowledge ready to be shared. A second thing is to try and get the discussions through the discussion pages more active. Right now, many discussions are still slow-paced. We should promote this more, but also make sure that we can follow up on these discussions easily. There are two ways to do this in a wiki. One is to watch the page (and the discussions), the second one is to mark the discussions as being “open”, so they can be aggregated and viewed through the proper category in the wiki. 13. Who would you like to see recruited to become Gentoo Developers? I’d like to see more package maintainers. There is still plenty of software without ebuilds, and that is after all what our users expect us to do the most. Even if a developer only maintains a handful of packages, that shouldn’t be a criteria to grant or deny access to the repository. With the (eventual) implementation of git repositories, we should also be able to work with the pull request methods allowing people who don’t want to become developer to still contribute to the portage tree. But the most important is not what technical or non-technical abilities they have, or which role they want to take in the Gentoo project, but rather their willingness to perform and work on an operating system used by several thousand users. 14. What else can we utilize the wiki for? When the wiki was first launched, I started using it as some sort of Knowledge Base . It allows for specific issues or misconfigurations to be documented and assist users in troubleshooting them. I still think this is a worthwhile set of documents to pursue, but needs a lot more content. I hope to, one day, be able to just mine the knowledge from #gentoo (i.e. historical discussions and questions) and put those in the knowledge base. Perhaps we can, one day, use the wiki as some sort of reference architecture for Gentoo. Such a reference architecture would explain readers how Gentoo could be used to create an integrated environment, where each component has bindings with other components, in a well-orchestrated manner. Right now, most documents focus on a single technology implementation and there is no full picture as to what Gentoo can really offer to organizations and companies of reasonable size. 15. What would you like the main site to be used for and what framework / language should we use for the redesign? Personally, I think it would be a good idea to focus on a small main site, using a no-nonsense interface like Bootstrap, with support for mobile devices. Keep the amount of information that is dynamic of nature on other sites, like the Gentoo wiki (perhaps in a closed category so that only privileged developers can access it, for instance if it is about the social contract) and focus on telling the reader what Gentoo is and how to get it. Underlying, this can even be made static HTML. That’s quite powerful, well known to most people, and doesn’t need any (potentially risky) modules on the web sites. 16. As a Gentoo Developer what are some of your accomplishments? It’s difficult to put these in any order, as their accomplishment value depends on the time 😉 Still, it would be to assist in the Gentoo Handbook, the creation of the Gentoo Foundation, improved integration of SELinux in Gentoo, the Dutch translations (now they’re fully abandoned, but were once the top translation language), package maintenance here and there, support on #gentoo and the Gentoo Forums and what not. 17. What would be your dream job? Honestly, I have no idea what it would be. However, it would not be as much about the content, but rather the energy that it would give me to go forward. A job with responsibility (but only on areas that you can influence – not the “You’re responsible for everything that goes wrong” kind of jobs), flexibility in hours, close to home, continuous education/improvement possibilities, lots of social contact (but not necessarily in team manner) and an innovative, evolving goal (not a day-in, day-out same kind of job). 18. What are the specs of your current boxes? I have two laptops at home (a 2-year old i5 and a recent i7 laptop), a hacked Samsung TV, a hacked Ubiquiti router and two Synology DiskStations (which I oddly haven’t modified yet). Next to the systems at home, I also manage two Dell PowerEdge servers which both host virtual systems for various personal purposes (such as attempts to move current cloud-driven solutions, such as Google mail and calendar) towards self-hosted solutions. These servers are co-located (luckily, because they make too much noise to be in my home). 19. Can you describe your personal desktop setup (WM/DE)? My previous one was fluxbox, which I enjoyed much as well. However, I ran XFCE due to a bug that someone reported (in SELinux support) and I wanted to reproduce it. And for some reason, it stuck. 20. 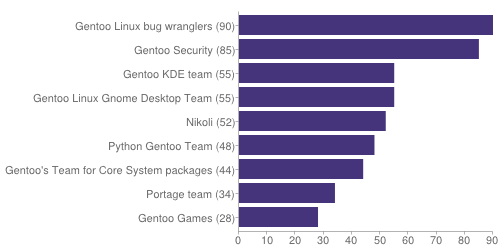 What gives you the most enjoyment within the Gentoo community? The appreciation received when fixing someone’s situation or helping them get the most of their installation. Honestly, I think that’s the best thing one can receive. Not only because it gives you a warm and fuzzy feeling, but also because these users often start helping others as well. This is why #gentoo is one of the largest support channels out there. On the 1st and 2nd of February, many Gentoo users and developers attended FOSDEM, the biggest F/OSS conference in Europe. Gentoo developer and council member Donnie Berkholz(dberkholz) had a talk about the status of distribution-level package management and the latest trends. Furthermore, a Gentoo BoF took place on Saturday. There, we had the chance to meet each other and talk about our favorite distro. The day ended with a Gentoo-ish dinner and beers at city’s center. First of all, Robin Johnson’s (robbat2) GnuPG key policy GLEP is progressing; it is now officially GLEP (draft) 63 , will be posted to the mailing list for discussion one last time soon, and be on the agenda of the next council meeting (March 2014) for final confirmation. In the meantime, we’ll be happy to receive feedback. About EAPIs, the council decided to immediately deprecate EAPI 0 and EAPI 3, which means they should in general not be used in new ebuilds anymore and repoman gives a non-fatal warning on commit. EAPI 1 and EAPI 2, already deprecated for long, will be banned immediately, in the sense that repoman does not allow committing new ebuilds (but existing ones keep working and can also be modified). Regarding stable keywords usage on m68k, sh, s390 some discussion about details took place. In the end, based on a suggestion by Mike Frysinger (vapier), it was decided that the profiles of these arches should all be marked as experimental; the consensus was that then package maintainers do not have to care about the keywording status on these particular arches and can e.g. remove the last stable marked or keyworded ebuild of a package at will. The last important topic that was brought up was the policy on tree wide use of the gtk / gtk2 / gtk3 useflags, or to be more precise the clash between the documentation provided by the gnome team and the policy decided on in a recent QA team meeting. Both Chris Reffett (creffett) as QA team lead and Chí-Thanh Christopher Nguyễn (chithead) presented their viewpoints. Further discussion touched upon the question how far-reaching policy decisions the QA team may make. In the end the council members affirmed that “QA’s right to create standards in glep 48 includes flag names / functions”. Subsequent discussion encouraged QA and Gnome team to keep talking. If you are interested in helping out, please visit our staffing needs page on the Gentoo wiki. 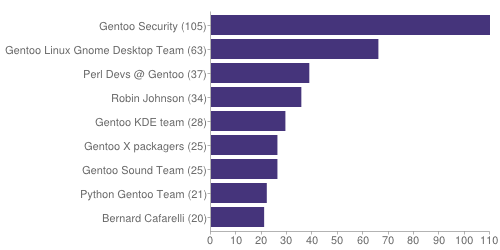 Gentoo is made up of 252 active developers, of which 40 are currently away. The Gentoo Foundation recently received a donation of services from Rackspace. We would like to thank Rackspace for their donation and for continuing to support Open Source and Free Software Projects. The following tables and charts summarize the activity on Bugzilla between 27 January 2014 and 26 February 2014. Not fixed means bugs that were resolved as NEEDINFO, WONTFIX, CANTFIX, INVALID or UPSTREAM. Are you using a packages that needs a maintainer? To find out use this python script developed by Ewoud Kohl Van Wijngaarden and Chris Stout. The script requires dev-python/beautifulsoup. Users can become maintainers for packages via the proxy-maintainer process. If you are using the nvidia proprietary driver, you may encounter a g-ir-failure as emerge will hang. There is also a forum post about this. Want to emerge (update) all installed packages which depend on some given package P? That will list all packages in short that are installed and have P in their dependency variables plus the package itself. What do you do if you encounter a bug and it may have already been fixed. Search on bugzilla with this to show all the bugs even if they have been fixed and closed? Gentoo Monthly Newsletter | Powered by Mantra & WordPress.